Nowadays, panel discussions are becoming the ubiquitous format for discussions. It is a useful way to trigger an exchange of viewpoints among team members (panelists) either by prepared statement or in response to the question or in supporting to others opinion. A Student Panel Discussion was held on the topics related to Social Media, Punjab National Bank Scam, Entrepreneurship and Sports in India, at IPER MBA Campus recently. A panel discussion is a factual discussion about a specific topic among selected members who share different perspectives, including the audience. The panel is consists of members and a moderator, who are experts or practitioners in the field. A moderator plays an important role in facilitating the panel discussion by engaging the team members and audience and by accelerating opinion, share facts and respond to audience questions. He/She should have an innate sense of pacing for the time distribution and a smooth approach of questioning and answering. With an aim of edifying about dealing the divergence of the viewpoints and opinion, the panel discussion is embedded in MBA curriculum at IPER through the Abhiyaan Series of Events every year. PNB Scam – Time for a Regulatory overhaul. Employment Opportunities – Entrepreneurship is the only way out. Sports in India as a Profession – Time for a new outlook. The panelists were IPER MBA second semester students who were ready with facts and figures on their respective topics. Every panel member shared their perspective to throw light on the topic. Every panel had an active moderator student who was ready to facilitate the panel discussion in an interesting, thought-provoking and informative way. Resultant, the audience present in the auditorium witnessed an excellent discussion. The students were evaluated on the basis of the facts they presented, public speaking approach, confidence, language command and the subject knowledge. 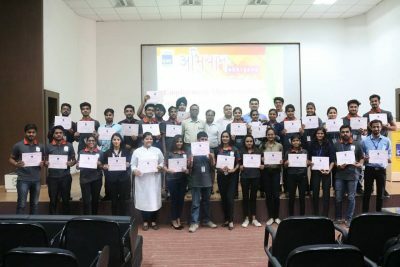 The winners of this Panel Discussion Event were Ashmi Iram, Shubham Saxena, Rashi Soni and Anubha Shukla of MBA Second Semester Class of 2019.